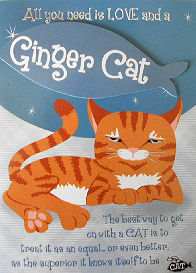 This everyday cat greeting card says: All you need is LOVE and a Ginger Cat. 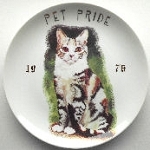 The best way to get on with a CAT is to treat it as an equal...or even better, as the superior it knows itself to be. Inside of the card is blank. The greeting card is 4 7/8" wide x 6 1/2" high. Envelope included. New.